Flipbooks are the original motion pictures, having been around for over 120 years. They don't require batteries, electricity or any power source other than a thumb, yet they create moving images based on the very same principles as movies and videos seen on IMAX, TV, computer screens, iPhones or virtually any other device you can think of. Flipbooks are small and yet so expressive. We at Fliptomania find this to be wondrous and amazing, and we love flipbooks for that reason. And we've found that we are not alone. 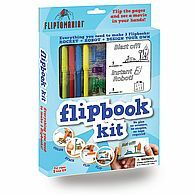 Indeed, people of all ages, backgrounds and nationalities are fascinated by flipbooks. Perhaps it's their elegant, hands-on simplicity, or the way they demonstrate that "less is more," or that despite their tiny size they can convey virtually any visual style or effect. 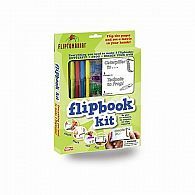 Whatever the reasons, it's clear to us at Fliptomania that flipbooks have a universal appeal that will never go out of style. Fliptomania was founded by Mark Weissberg in 1997. His life-long fascination with filmmaking and the history of the moving image — from early devices with weird names like thaumatropes and phaenikistocopes, to the creative genius of inventors and artists like Eadweard Muybridge, Etienne Jules Marey, George Melies and Doc Edgerton — has inspired him and the Fliptomania staff to create flipbooks that reflect both traditional and cutting edge styles — and sometimes a combination of them. 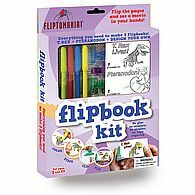 We hope our flipbooks inspire you to create your own flipbooks. We know how truly satisfying this creative process is, and through our flipbooks and flipbook kits we're committed to nurturing the artistic quest and education of anyone that wants to be a part of the world of the moving image.